The highs and lows of any trip are usually accentuated by the successes and failures of the food enjoyed. Norfolk, like Cornwall, profits from its geographical remoteness and the propensity of its own locally produced fresh food. Serendipity can play some part in hitting upon a particularly pleasurable meal but recommendation is usually your best bet. This was the case with a recent visit to the North Norfolk coast. 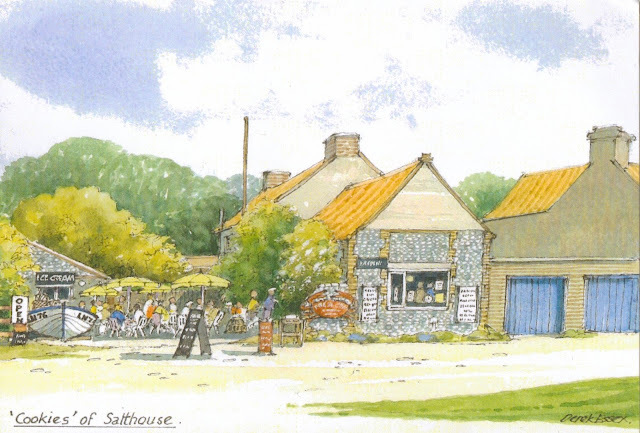 A friend and long time Norfolk resident had pointed me in the direction of Cookie's Crab Shop at Salthouse near Holt. Cookie's opens 9am-7pm every day except Christmas day and has been doing so for more than fifty years. This monumental undertaking is truly a labour of love on the part Suzanne and Peter McKnespiey, the third generation to run the shop, and guarantees for any visitor the freshest of ingredients. The intimacy of the surroundings is summed up in Derek Essex's watercolour - tables and chairs spilling out for those who want to take in the spectacular view of the salt marshes, a small garden gate separating diners from the back of the McKnespiey's house, local vegetables and of course a full selection of all that is on offer for those who wish to relive something of the pleasure of lunch at Cookie's on their return home.